Attention nonprofits, we just launched a new feature! 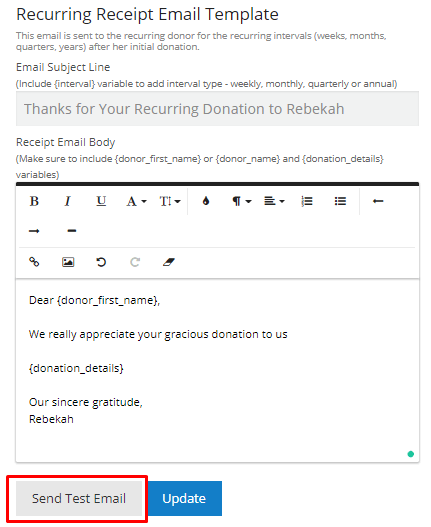 You can now send yourself test receipt emails to see first-hand how your donation receipt template looks when it is sent out to your donors. There are two types of email receipts you can test, the first being for initial and one-time donations. Start by heading over to your Donorbox dashboard and clicking the “Edit” button by the campaign whose receipt email you wish to test. Go to the “Email” tab of your campaign editor and, once you have drafted you email template, click the gray “Send Test Email” button. This will send a test email to the email address you used to create your Donorbox account. You should get a popup notification letting you know that the email has been sent. The second type of email receipt you can test is the one for subsequent recurring donations. 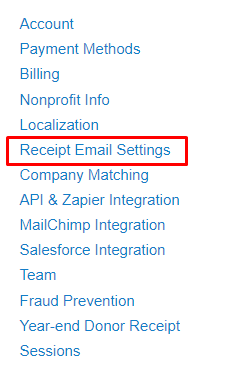 To do so, go to your Donorbox Account page and click the “Receipt Email Settings” link on the left-hand side. Here again, once you have drafted your email template, click the “Send Test Email” button. That’s it! 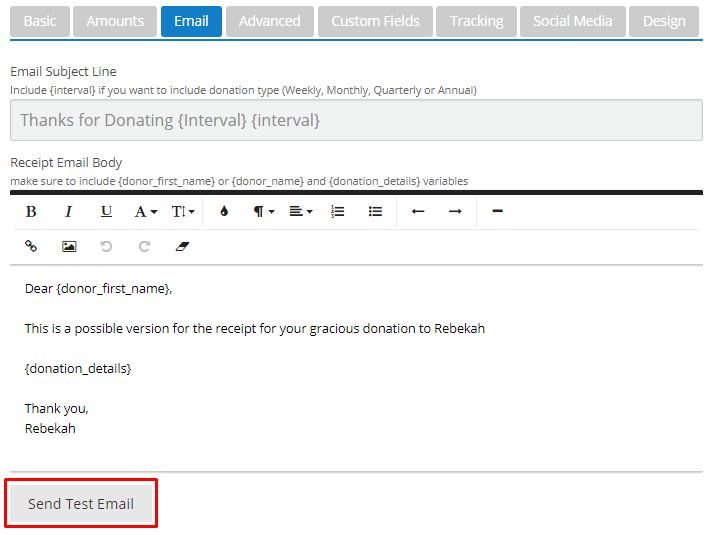 Your test email will be waiting for you in your inbox, complete with a randomized name and donation amount.